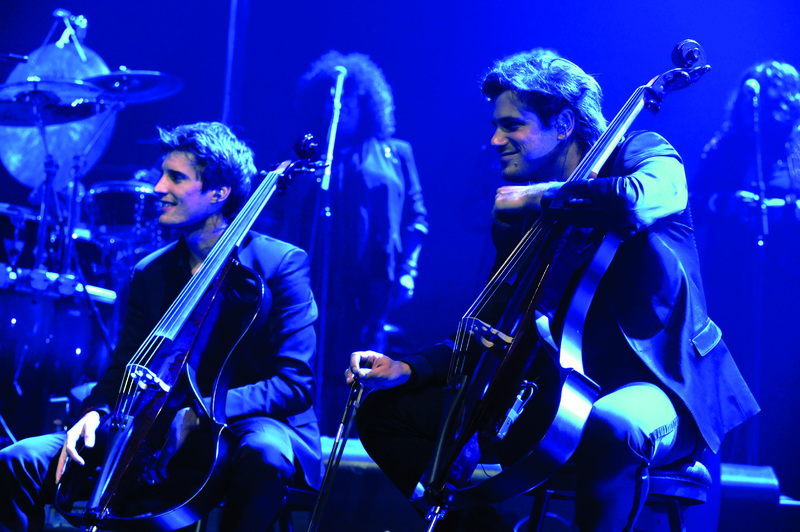 The first and only opportunity to experience internet sensations 2CELLOS live with orchestra in the United States will be in the Greater Cincinnati area on November 2, 2013. Luka Sulic and Stjepan Hauser will play classical showpieces with the KSO, then offer their own incredible duo arrangements of hits by Guns N’ Roses, Rihanna, Coldplay, U2, Michael Jackson, Sting and more. In the past seven months the Kentucky Symphony Orchestra has scored two international firsts — the U.S. orchestral premieres of classical music’s comedy team of Igudesman and Joo (Big Nightmare Music) (April 6) and now 2CELLOS (Nov. 2). “Being the first orchestra in America to showcase the incredible talents of these performers, who have taken musical crossover or ‘genre bending’ to new heights, is a real coup,” said KSO Music Director James Cassidy. Luka Sulic and Stjepan Hauser, two classically trained and award winning cellists from Croatia, were experimenting and having fun making up arrangements of pop tunes when a friend videoed their playing of Michael Jackson’s “Smooth Criminal.” An upload to YouTube and 5 million hits later, Elton John called to book 2CELLOS to open his World Tour. Sony called shortly thereafter with a recording offer. Florence, Ky will be one of the 19 concert stops on their three-week tour of the U.S., and the only concert with orchestra. 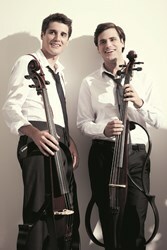 Even though 2CELLOS have performed on the popular television show Glee and in the largest U.S. cities as a duo act, no orchestra in the states (before the KSO) invited them to showcase both their considerable classical music abilities together with their technically elaborate covers of 1980s -2000s elite rockers and pop artists (i.e. Guns & Roses, Cold Play, U2 etc.). The KSO which opened its 22nd season in October, has a long string of firsts, premieres and a completely unique approach to programming throughout its 21 years. “I have never been interested in just playing from the top-100 orchestral rep list or copying other traditional orchestras. The KSO is where people come to see it first in the region or maybe only once in a life time,” Cassidy stated. Luka and Stjepan recently performed with the Red Hot Chili Peppers, George Michael, and Leona Lewis, and they released their second album, IN2ITION, in January. The CD was produced by the legendary Bob Ezrin (Pink Floyd, Alice Cooper, Kiss, Deep Purple) and features eclectic vocal and instrumental guests including Elton John, Steve Vai, Lang Lang, Naya Rivera and Zucherro. If you like your Vivaldi and Piazzolla on the rocks with a splash of U2 and Sting, then don’t miss this show. One Night Only! Join music director James Cassidy, members of the KSO and the amazing 2CELLOS 8 p.m., Saturday, November 2 at Florence Baptist Church at Mt. Zion. Tickets for this special engagement are $24, $32, $40 (children 6-18 are 50% off). For more information and tickets call the KSO at (859) 431-6216 or visit http://www.kyso.org. The Kentucky Symphony Orchestra takes the “phony” out of symphony through live thematic concerts that culturally enrich, educate and entertain the residents of Northern Kentucky and Greater Cincinnati. The KSO performs throughout Northern Kentucky performing three series of concerts, for the schools, in the parks and various indoor venues.